The main British fighter type of early World War II. The prototype first flew in November 1935. Widely used in the French campaign in 1940 and massively used in the Battle of Britain. no autocannons, don't expect to get quick kills off most tier Vs. The First of the two hurricanes available in game. The Hurricane Mark I may not have the same agility as the Bristol 146, but it packs the exact same menacing punch in terms of firepower. 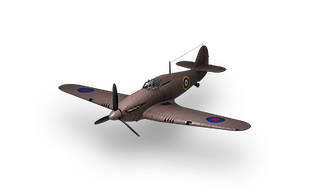 It also has an 8 second boost duration, meaning that if things get too iffy, the Hurricane Mk I can usually zoom out of danger to reposition itself or lick its wounds. The key with the Hurricane Mk I - if using it solely against aircraft - is to be mindful of who is around you. Try to take out planes that can out-turn you in a single pass first, and avoid turn and burn battles with them, then go for less nimble targets until such threats come around again. As long as you keep watch of what is around you, you will do decently with the Hurricane Mk I. The engines should come first, the second engine is shared with the Spitfire I. Next should be the guns, if you have already passed the Bristol 146, mount them immediately. This page was last modified on 7 July 2018, at 16:58.